Insider Fix: Derek Zoolander Out of Fashion?! 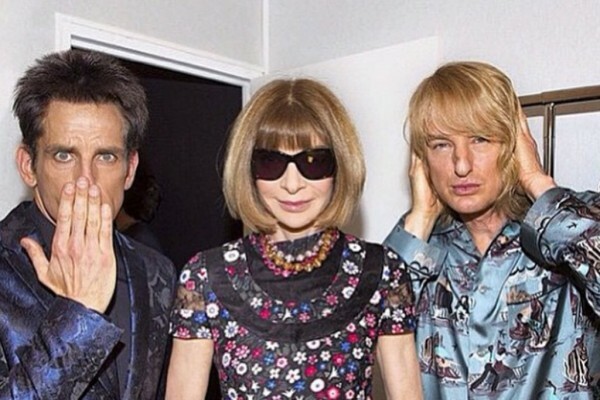 Derek Zoolander, Anna Wintour, Hansel. Vogue Instagram. Fashion is fickle and you heard it here first: Derek Zoolander, once the most in-demand male model on the planet, is over. And the same goes for his blonde boho counterpart Hansel. The mods might have been the hot ticket at the fall/winter 15 collections in Paris—bestowed the highest honor of closing the Valentino show—but they’ve been declared “old” and “lame” by rivals. Should we blame Anna Wintour? Catwalk comebacks, however, do happen. Just ask Christy Turlington, Linda Evangelista, Gemma Ward, Emma Balfour—the Nineties icons don’t intend to go down without a fight. Cue: An exclusive look at Zoolander 2, coming to a runway big screen near you February 2, 2016. Or to put it into perspective, only 76 sleeps…and counting.